Fewer things are more exciting to a child than the promise of a family vacation in an exotic, new location. Such experiences offer wonderful opportunities to learn, explore, and see the world at a young age! For families with children with special needs, however, planning a vacation can pose a few challenges. 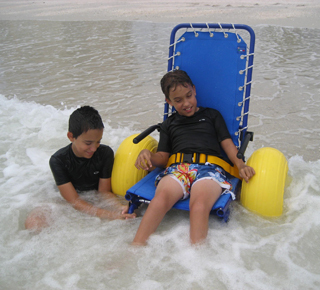 Cruising can be an ideal vacation choice for families with children with special needs. A cruise offers a chance to visit multiple destinations, without the hassle of flying or driving from city to city. Additionally, the consistency of a single mode of travel and a permanent stateroom (as opposed to multiple hotels, rooms, planes, trains and automobiles) provide a more stable environment for travel – an important plus for children who may be uneasy with changes in routine. Fortunately, today’s passenger cruise ships easily accommodate persons with special needs, and many cruise lines are more kid-friendly than ever. Almost all ships offer supervised, age-appropriate activities for children, menu/dining options that appeal to young people, and a variety of onboard resources to make travel easy and convenient. Book Early: Most cruise lines have a designated number of accessible staterooms. Be sure to carefully consider whether an accessible stateroom is a real necessity for your family, as these rooms are limited and should be reserved for those who truly need them. Booking early also ensures plenty of time to plan for/help your child with special needs adjust to the idea of traveling. Alert the Line: Ships with designated youth programs are often prepared to accommodate children with special needs. Some lines even have specialized staff trained in sign language and other skills to accommodate children with special needs. It’s essential that you contact the cruise line in advance to let them know that your child will be on board and outline your child’s specific requirements. Some cruise lines may even add extra staff if they have advance notice that a child with special needs will be on board. Boarding: Find out if you are eligible for priority/early boarding, and be sure to arrive early to the port to allow additional time for handling special needs and screening processes for equipment and medication. Rent the Equipment You Need: Check out our tips on bringing vs. renting your special needs equipment. Unless you’ve got specific reasons for bringing your child’s personal equipment, renting may be the easiest, most convenient option. Special Needs Group provides pediatric wheelchairs, pediatric oxygen concentrators and flow meters, bed rails for children, and much more (including beach wheelchairs). In addition to equipment, Special Needs Group can also deliver baby formula, diapers, nutritional supplements, and specific baby food directly to the ship. Find out more about our services on our website, and don’t hesitate to contact us on Facebook or Twitter.